The human foot is a strong and complex mechanical structure containing 26 bones (some people have more), 33 joints (20 of which are actively articulated), and more than a hundred muscles, tendons, and ligaments. The hindfoot is composed of the talus or ankle bone and the calcaneus or heel bone. The two long bones of the lower leg, the tibia and fibula, are connected to the top of the talus to form the ankle. Connected to the talus at the subtalar joint, the calcaneus, the largest bone of the foot, is cushioned inferiorly by a layer of fat. The forefoot is composed of five toes and the corresponding five proximal long bones forming the metatarsus. Similar to the fingers of the hand, the bones of the toes are called phalanges and the big toe has two phalanges while the other four toes have three phalanges. The joints between the phalanges are called interphalangeal and those between the metatarsus and phalanges are called metatarsophalangeal. The arch functions as a shock absorber for our entire body. Each time we step down, we place up to 5 times our body weight on the foot, depending on whether we are walking, running, or jumping. If there was no shock absorber in the foot, the force of each step would fracture or dislocate the bones of the foot, leg, and lower back. 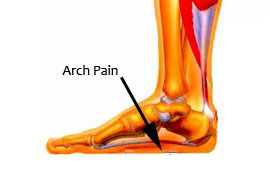 When pain occurs in the arch, it is telling us it is "sick" and cannot function properly. If left untreated, this will lead to a fallen arch, which will cause constant pain throughout the entire foot, and eventually the knee, hip, and lower back. 1. Repetitive activities, such as walking or running too far; jumping; or standing on hard surfaces for long periods of time. 3. The natural aging process. 4. Biomechanical defects of the foot, or abnormalities we are born with, such as very high or low arches, or pronation (a turning out of the foot, causing us to walk more on the inner border of the foot). The normal arch is made up of bones and joints which are held tightly together, in a precise relationship. When this relationship is subjected to repeated abnormal weight, or the normal weight of a lifetime, the force breaks up this normal relationship, causing bones to shift and joints to buckle. This allows the arch to collapse, and produces pain. The ability of the arch to absorb the shock of each step is reduced, so that continued walking will eventually produce pain in the knee, hip, and lower back. All four of the above categories will eventually cause this to happen. Treatment must be directed to supporting the individual bones and joints which make up the arch, and to aid the arch in its job as a shock absorber. This in turn alleviates the arch pain, and prevents the further collapse of the arch. This is accomplished through the use of orthotics and proper footwear. Custom-made orthotics gently support not only the arch, but each individual bone and joint which makes up the arch. This not only relieves the arch pain, but prevents it from returning, and keeps the arch from collapsing further. The two most common causes of pain in the bottom of the heel and arch are heel spurs and plantar fasciitis. The plantar fascia is the thick ligamentous band in the bottom of the foot which is attached to the heel, and runs forward to insert into the ball of the foot. Plantar fasciitis is an inflammation of this band at its attachment to the heel. Plantar fasciitis pain is usually located in the center or the inner side of the bottom of the heel. The pain is most intense when first standing, after any period of rest. Generally, people with this problem experience their greatest pain in the morning, with the first few steps after sleeping. After several minutes of walking, the pain becomes less intense and may disappear completely, only to return later with prolonged walking or standing. If a nerve is irritated due to the swollen plantar fascia, this pain may radiate into the arch or the ankle. Each time we take a step forward, all of our body weight first rests on the heel of one foot. As our weight moves forward, the entire foot begins to bear the body's weight, and the foot flattens and this places a great deal of pressure and strain on the plantar fascia. There is very little "give" to the plantar fascia, so as it stretches only slightly, it pulls on its attachment to the heel. If the foot is properly aligned this pull typically causes no problems. However, if the foot is "pronated" it causes an abnormal stretching of the relatively inflexible plantar fascia, which in turn pulls abnormally hard on the heel. Treatment must be directed towards realigning the foot as it goes through the gait cycle, and reversing the abnormal effects of pronation and supination on the plantar fascia and heel. In doing this, the abnormal pull of the plantar fascia on the heel will be made to disappear. This in turn, alleviates the pain and inflammation at the heel. Realignment, or proper postioning of the foot, is accomplished through the use of orthotics. Custom-made orthotics gently hold the foot in a proper or neutral alignment when it strikes the ground, preventing pronation or supination. Custom-made orthotics will also: reduce the pull of the plantar fascia on the heel, by supporting the arch; and cushion the heel, to provide an immediate decrease in pain. Custom-made orthotics will not only relieve the pain, but they will also prevent it from returning. is the most common form of arthritis found in the foot. It is generally due to the normal wear and tear that our joints undergo during our lifetime. There is some truth in the saying: "If you live long enough, you will develop osteoarthritis." It may also be due to a joint injury. This injury can be due to over-utilization of the joint, a fracture, or surgery on a joint. The most commonly affected joints in the foot are the toe joints (phalangeal joints) and the metatarsophalangeal joints. These are the joints located in the balls of the feet (in the forefoot area) — the joints where the toes attach to the feet. *a reduction in how far the big toe can be pushed up (dorsiflexion). Brief period of morning stiffness (15 minutes or less). Aching pain in one or more joints which increases with use, and is relieved by rest. Pain is not migratory. This means that symptoms are usually experienced in the same joint, rather than in one joint today, and a different joint tomorrow. The affected joint usually appears swollen, and this swelling feels "hard." However, there is no redness nor increased warmth around the joint. The range of motion of the joint is usually limited. OA begins with an uneven wearing down of the joint cartilage, which may be due to: over utilization of the joint, an injury to the joint, etc. This produces a narrowing of the joint space, and finally bone begins to rub against bone. When bone rubs against bone we may experience pain, stiffness, decreased movement of the joint, and swelling. significant slow-down in the progress of the disease within the affected joints a reduction in the chances of injuring other joints when we walk. If we have a painful joint (or joints), we subconsciously force ourselves to walk in an abnormal manner, so as to try and keep all pressure off of the painful joint. When this is done, we apply abnormal and excessive pressure on other joints in the foot. This is called compensation. This compensation leads to over-utilization of these joints, and new sites of osteoarthritis. ﻿create depressions in this padding that the painful joint sits in, reducing the pressure applied to that joint each time we take a step, and allowing these joints to "rest" and heal. Hallux Limitus and Hallux Rigidus are the terms usually applied to osteoarthritis of the big toe joint (1st metatarsophalangeal joint). When this joint has osteoarthritis it is treated by using a custom-made orthotic with a Morton's Extension under the first toe. This Extension protects the joint by reducing the amount of pressure we apply to the big toe when we "push off" with each step. The orthotic and Extension reduces the bending of the big toe joint, by allowing the orthotic to help the rest of the foot "push off," and allowing the big toe joint to "rest" and be painfree. Maintain the foot in a neutral or normal position by preventing it from rolling in or out. This helps to remove excessive pressure from the big toe and the little toe joints. Our custom orthotics accomplish this with the use of comfortable balancers and posting. A bunion is the result of a complex deformity of the big toe and the bone it connects to, the first metatarsal. The deformity occurs at the joint between the two toes. At this point, the head of the metatarsal protrudes outward, causing a bump on the inner side of the joint and toe; and the big toe moves towards the adjacent toe. Bunions may be hereditary. They may also be related to narrow shoes, injury, or arthritis. Shoe pressure on the toe and bump will cause redness and pain. Remedies are designed to alleviate painful shoe pressure on the bump, and to keep the big toe straight (this helps to slow down the progression of the pathology. The most common remedy is the creation of a custom orthotic. Calluses are areas of accumulated dead skin found on the bottom of the feet. The most common calluses are found on the balls of the feet. These areas of hard dead skin can be diffuse, and spread over a broad area, or they can be localized to a small area, and be very deep. Both types can be very uncomfortable. Causes: Calluses are the result of an underlying problem which exists in the foot. The normal foot can carry our weight comfortably, without the formation of calluses and pain. When a callus occurs, it signifies a change is occurring in our metatarsals (the long bones of our feet to which our toes connect). We have five metatarsals, and they each carry a portion of our body weight as we walk. When one or more metatarsals carry more weight then they are supposed to, the skin under these bones becomes thick, hard, and painful. Adjusting and accommodating for any abnormal walking patterns you have, such as pronation (a twisting of the foot outward, so that as you walk you apply more weight on the inner border of your foot). Pronation, and other biomechanical defects such as intoeing, outtoeing, high arches, etc... affect the way weight is distributed across the balls of our feet when we walk. Orthotics allow the feet to function in a normal (neutral) position when they strike the ground, rather than in a twisted (malaligned) position, thus removing the excessive weight and pressure from painful calluses. The same pair of orthotics can be used in your dress or athletic shoes (you will need only one pair to provide you with comfort in all of your activities). A neuroma, or Morton's Neuroma, is a benign soft tissue mass which forms on the nerve which runs between the metatarsals, in the ball of the foot. When two metatarsal bones are squeezed together, they pinch the nerve that runs between them. This squeezing together of the metatarsal bones is usually a result of: narrow shoes, high heel shoes, injury, or a biomechanical defect of the foot (such as loose ligaments; pronation, a turning of the foot outward, so that you walk more on the inner border of the foot; or aches which are too flat or high). Custom Orthotics with a Morton's Extension not only relieves the pain, but will also correct the biomechanical defects which may be the reason the neuroma is present. Our orthotics are comfortable, and are made of lightweight materials; they gently support the arch; and will fit in most shoes.